Breakfast at the hotel opens around 6:30. Sarah likes to sleep in, so I usually head out to breakfast as soon as I wake up in order to leave her in peace. I usually use up my free 20 minutes of hotel wi-fi during this time and then chill out with the rest of the early risers, slamming 2 or 3 cups of coffee and preparing for the day. Once at the course, we all slap on last minute sunscreen, headbands, bobby pins, hats, etc. and head out for our warmup which is 15 minutes of jogging or erging. We have discovered that there are no 15 minute runs that do not include enormous hills… much to my dismay. But they do include awesome scenery, as well as families of draft horses and free range chickens. There is a dam at the end of the lake that has a single car lane and a crossing for pedestrians, which makes for a really great morning jog. Then it’s a short body circuit, and on to the water. After row #1 we head to the caf to grab lunch. Lunch has been exceptionally good… better than the hotel food (which isn’t bad). I think the general vote is that the food at the course is better than the hotel. It’s been a lot of fish, chicken, lamb, and fresh vegetables, as well as a lot of coffee. A LOT of coffee. Lunch also usually includes a lot of screwing around, laughing, and… scouting for the 2010 LIST (so far, so good). Then after a short break we hit the water again, usually for a shorter row. Then we usually run frantically for a 4:00 bus with the rest of our teammates back to the hotel. Showers, dinner, maybe a trip to the physio, and then dealer’s choice of cards, Bananagrams, Pass the Pigs, or lamenting the deplorable internet situation before bed. 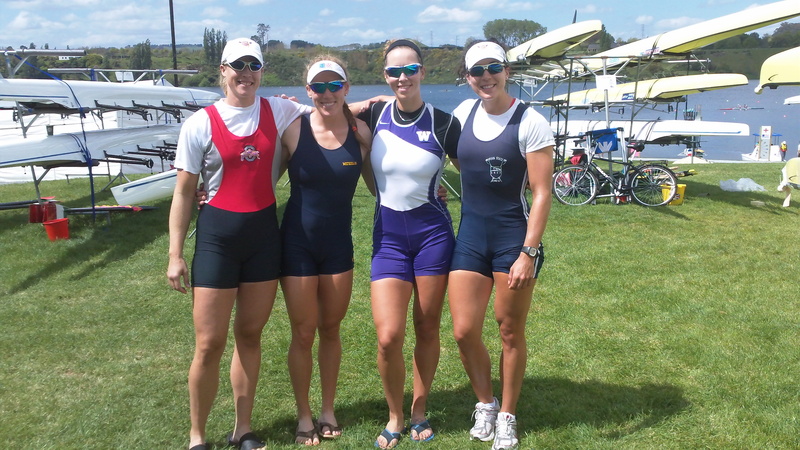 Video installment #3 is a standard day at Karapiro with the US Women. We’ve been trying to coordinate wardrobes on this trip across all the camp boats (never before attempted while I’ve been on the team), and so much of this video was shot on “college uni day” on which we all sported our university unis to represent our college programs. We’ve all got just a few more days to bring everything together before our debuts at this year’s World Championships. Most of the Federations are here, with a few last-minute arrivals slated for this afternoon. The W4X did some ripping pieces with the W8+ this morning, and I think we’re all feeling pretty good about taking another step in the right direction. We are the first to race on Sunday, so are gearing up for that with as many good strokes as we can get, good food, and good rest. And possibly personal-sized jars of Nutella (one for me and one for Sarah). Whoops. We’re thinking about you guys!! Good luck! !